Food coloring, water, a preservative and a pound of morphine powder. These are the ingredients in Dr. Anne Merriman's recipe for liquid morphine. "It's easier than making a cake," says Merriman, a British palliative care specialist who founded Hospice Africa in Uganda in 1993 and helped design the formula that hospice workers in Uganda have used for 22 years to craft liquid morphine. The lightest dose, dyed green to indicate the strength and to make sure people don't confuse it with water, costs about $2 per bottle to make. Stronger doses are dyed pink and blue. A 16-ounce bottle is about a week's supply for most patients. Back in the 1990s, two of the biggest barriers to good death in Uganda were simple: not enough doctors and not enough morphine. Largely through Merriman's drive, Hospice Africa Uganda developed professional education in palliative care that would spread the responsibility to nurses, rather than relying on doctors. They helped make it mandatory for medical students in Uganda to study pain management – before Germany did. And Hospice Africa Uganda made liquid morphine. "I had been one of the doctors who had said to people, 'Sorry, there is no more we can do. You have to go home,'" says Merriman, of the time she spent working with cancer patients in Singapore starting in the 1960s. There, she says, "I found that patients with cancer were getting every treatment possible with chemotherapy, and then when it didn't work they were sent home and they were dying in agony." Merriman would eventually be invited to Kenya to set up a hospice care program in Nairobi before founding her ownorganization in 1993, based in Uganda. At that time, palliative care in Africa only existed in Zimbabwe and South Africa, and the services, she says, were "started out by whites for whites." Medication was prohibitively expensive for most patients. "The strongest they had there was codeine — if you had money. But if you didn't have money, you only had aspirin and sometimes nothing at all," says Merriman. Today, the organization's three hospice centers serve some 2,100 outpatients. "It's not always the pain that's their greatest worry," she says. "It's often 'What's going to happen to my children when I die?' It may be spiritual problems, it may be cultural — things they have to carry out before they die. We try to help with all those kinds of things." Merriman ran up against opiophobia in Singapore and Uganda, where she says, people thought she was providing morphine so that patients could kill themselves. "And morphine can kill," she says. But with the right regulations in place, and the right explanation to the patient and their relatives, she says, "it's very safe." "You've got to be careful, everything has to be signed for and we have to follow the regulations," she says. "But for the last three years, we've been making morphine for the whole country." Merriman says of the 24,000 patients in total that they have prescribed oral morphine to, "we've had no addiction, no diversions. And the patients keep the bottle at home." In Uganda, she had to work hard to surmount the fear of opioids. For example, Hospice Africa Uganda worked with narcotics police, teaching them what morphine is and that it's a legal medication. 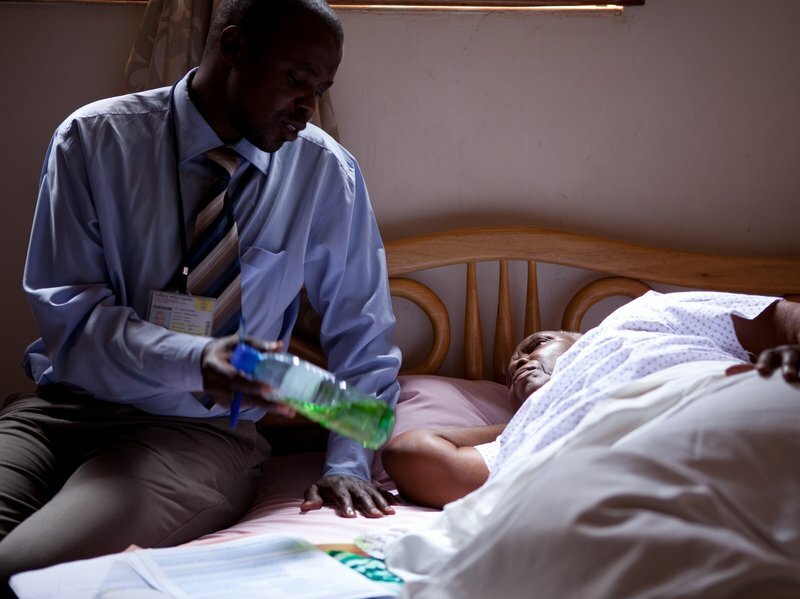 "They need to understand that patients can take morphine and that they are not addicted, that it is handed to patients after careful assessment, and that it is a safe medication," says Dr. Eddie Mwebesa, clinical director at Hospice Africa Uganda. Without police cooperation, he says, "there will be a lot of trouble with patients having their morphine in the home" and in transporting the drug between hospices or patient homes. Clinicians prescribe the morphine and instruct patients to sip a dose from a marked cup. For adults, it's usually about a teaspoon every 4 hours. Merriman says hospice workers frequently have to warn people about morphine — not because of the risk of addiction but to explain that it will not wipe out their illness. She says they feel so good after it, they often feel normal again. "They think we've cured them," she says. Even with the innovations in Uganda, there are still challenges. The organizationestimates that only 10 percent of Ugandan patients in need of palliative care can access it. "The biggest challenge we have right now is the sheer number of patients who need palliative care," says Mwebesa — he puts the number at 250,000 to 300,000. But there is about one doctor for every 20,000 Ugandans, he says. Mwebesa says palliative care can cost about $25 each week for one patient. "It doesn't sound like a lot," he says, "But actually most people can't afford it." Only 2 percent of Ugandans have health insurance, so many families have to pay out-of-pocket to care for sick relatives. Even though Uganda is far from perfect, it remains in many respects a model country for its neighbors. "We had the minister of Swaziland visit Uganda to see how Uganda reconstitutes oral morphine and then when we went back, they started doing the same," says Dr. Emmanuel Luyirika, executive director of the African Palliative Care Association. He says the same happened with Rwanda and Malawi. Merriman is now turning her attention to French-speaking countries in Africa. She says some countries in the region remind her a lot of Uganda back in the '90s. "They've got a fear of morphine. Doctors don't want to prescribe it because they think if they prescribe it, they'll be accused of being addicts themselves," she says. World Bank data shows the region has the world's highest maternal mortality and lowest national health budgets. And people there largely pay for health care out-of-pocket. "If you haven't got money," says Merriman, "you can't even get an aspirin." At age 80, she's still determined to see that the dying don't have to face such dilemmas when they seek relief from pain.